Doreen Mugide — Educate! | Preparing youth in Africa with the skills to succeed in today’s economy. 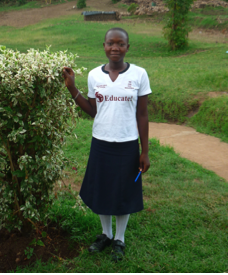 Doreen Mugide’s favorite Educate! lesson is to envision the end result when planning a project. This lesson has inspired a sense of determination and optimism, which has been key to the success of her fish farming business. Her project started out as a simple fish pond, constructed out of materials provided by family and community members, and has grown into a business that provides several jobs, a desired commodity, and financial income for local families. With the help of her Educate! Experience lessons, Doreen knows this project will be successful! !